I was wrong. Even with three fewer days, I set another traffic record in February, passing the January figure of 35,739 late this afternoon. I’m at 35,851, with a good chance of passing 36K this evening. And no post that I published in February topped 500 views or made it into my top 10 most-viewed posts of the month. More than 90 percent of this record traffic came from my archives. 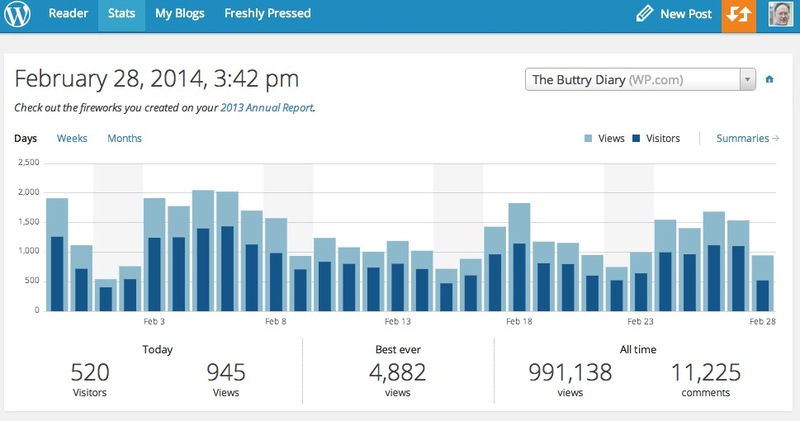 Continuing a trend I noted in one of three posts on metrics this month, a Knight Center for Journalism in the Americas massive open online course (MOOC) drove thousands of February views (4K+) for my 2012 “Embrace discomfort” post that hadn’t topped 1,300 views in its first 17 months online. The MOOC also was responsible for a surge in traffic to a 2012 post about being personable but professional on social media and a 2012 post on how and what journalists should tweet. The post on being personable got more than 1,400 February views, slightly more than in its first 21 months online. The advice on what to tweet topped 1,000 views in February, well below the 2,665 views it got in August 2012, when I posted it, but more than it received all of last year. Another big draw in February was my post on Twitter’s follower limit, which I noted in January is getting strong search traffic. After getting more than 2,000 views in January, it topped 1,900 in February. Two of my top posts of the month were actually fairly fresh. Late-January posts announcing Project Unbolt and explaining the characteristics of an unbolted newsroom each topped 500 views in February. As for actual fresh posts in February, I was not able to keep up January’s pace. This is the 17th post of the month, compared to 31 in January. Six posts about Project Unbolt contributed nearly 2,000 views to the traffic record. A post this week about editing rigor led the way with more than 440 views. The second most-viewed post of the month was yesterday’s post advising journalists reporting about tweets to grab screenshots, especially if a tweet might be deleted. Four posts didn’t even reach 100 views. But one of the February posts might have boosted the daily flow by a trickle. The index to my #twutorial posts got only 335 views, but it’s primarily a page of links. If most of them clicked one of those links, that post might have spread another 200 or 300 more views to other posts. Though I couldn’t maintain the pace of the first week of February, when the “Embrace discomfort” blog got its surge, traffic was strong through the month, with 18 of 19 weekdays (probably 19 of 20 by the end of today) topping 1,000 views. Traffic topped 1,500 views 10 times, including a Saturday. I suspect that you can thank the MOOC for this wonderful surge in traffic. I am one of the students and thanks to the course have discovered your blog and become a subscriber.